The report sheds light on the important role of family and schools in introducing young people to golf, and how factors such as affordable equipment rentals, shorter courses, fast-track learning, relaxed dress codes and friendly, social environments could help clubs recruit and retain young players. Click here or on any of the cover or pages to download your free copy. The findings, which have been welcomed by the leading children's golf organisation, The Golf Foundation, are designed to help clubs and courses identify potential solutions to retain current junior golfers and attract to new players. 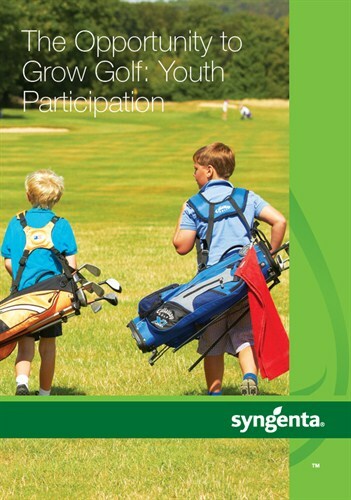 Simon Elsworth, Syngenta Head of Turf & Landscape (EAME), said: "While some of the responses from the series of focus groups might have been expected, listening carefully to what young people have to say about sport and golf, what interests them and what would engage them further is enlightening. "In many ways, what youth say about golf in terms of its friendliness (spending time with friends and family; customer service) and flexibility (opportunity to play 9-holes rounds; dress codes) is consistent with what many existing golfers and prospective players say and want." Simon added: "From a business perspective, youth participation is an important strategic opportunity for golf as a sport and a business. Giving young people opportunities to engage in golf in a way that will enable them to enjoy the many benefits it offers as a sport and social activity will help develop long-term participants and customers." Brendon Pyle, Development Manager and Acting CEO of the Golf Foundation said: "This reports is greatly appreciated by the Golf Foundation. It confirms much of our own understanding of young people and their perception of golf whilst also offering new insight into ways of recruiting and retaining more young people in the sport. "Reassuringly, several of the factors identified by the study to encourage young people to start golf are already being applied by the Golf Foundation and its partners." 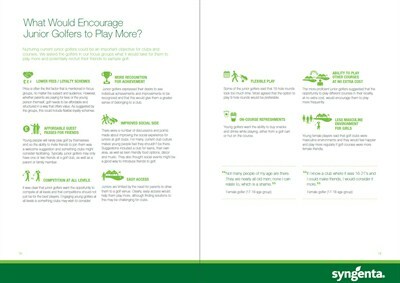 Syngenta's golf market research is designed to provide clubs and courses with information that will help them make customer-focused decisions to maximise market opportunities and deliver long-term business benefits.